India having a torrid time in this first test match between South Africa where their batting ripped through and bowling torn apart all around the ground. But in an almost lost cause there was still something which India could cheer about was, none other than Sachin Tendulkar. Yes- he has become the only batsman in the cricket's history to score 50 Test centuries. This has happened today on 19th December 2010, where India following on a massive South African lead of 484 runs.Though some good contribution from top of the order , the ask was still way too much. But in the process Sachin Ramesh Tendulkar was able to create history for cricket. Taking single of Dale Steyn he reached this historic milestone at Centurion.He completed this amazing achievement in 197 balls, in an attempt to save the match. But it was not long when Indian captain MS Dhoni was caught behind on bowling of Steyn on 90. India on stumps were 454-8 with 30 runs deficit. With one day still left , South African victory looks inevitable , unless weather brings miracle in Centurion. Tendulkar has scored seven centuries and five fifties in year 2010,with one test remaining scheduled on December 26. 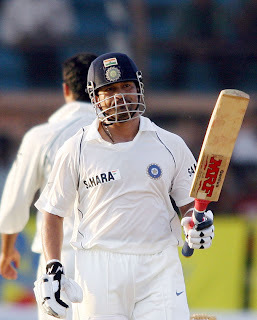 He till date has amassed more than 14,500 runs with 59 half centuries in his kitty. He scored his first century in 1991-92 tour to Australia.